During the summer of 2018, I was blessed with the opportunity to travel to India with a non-Scouting group of individuals from around the world to work with the local schools in Hyderabad. Service to others is a significant aspect of the Scouting Movement, and as a member, I strive to not only serve the local community, but the global community at large as well. The purpose of my group’s trip was to help implement a sustainable change that would be beneficial to the learning environment of some of Hyderabad’s students. After being divided into smaller groups and assigned to a specific school, my group was able to interact with the students and teachers to learn about their education system. Friendships were made, and a sense of trust was established between our team and the Hyderabad students. Through our observations and class discussions, it became quite clear to us that the students were lacking the necessary materials required to learn, and that they did not have a clean space to play in during their breaks. Having spent two days getting to know the students, it was time for us to take action. Our team provided the students with dictionaries as well as support on how to use them. In addition to this, we put together interactive presentations to educate the students on bullying, personal hygiene, and safety. My values as a Scout truly came into effect when I suggested to our group that we clean up the school’s outdoor assembly area and teach the students about the importance of caring for the environment. After several days of interacting with students at the school, we were able to engage all grade eight and nine youth in a school-wide cleanup. 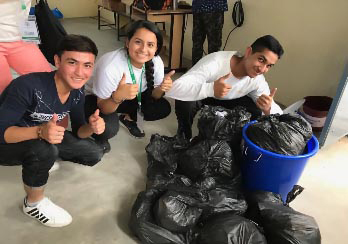 As a team, we successfully collected twelve garbage bags filled with food wrappers and other scraps that were dispersed throughout their assembly area. Since this was where they had their assemblies, ate their lunches, and played games, it was of utmost importance to improve the physical condition of this area. After cleaning up the school, it came to our attention that there were no designated areas to place the garbage until it was picked up. While it is normal for Canadians to have multiple bins to dispose of different materials, many people in India don’t have access to, or understand these utilities, which results in a significant amount of littering. To prevent this, we purchased and placed garbage bins throughout the school that would be emptied on a regular basis. In addition to this, we worked with the students to create posters with messages that encourage a clean, safe environment. The founder of Scouting, Lord Baden Powell, once said, “Try and leave this world a little better than you found it”. This concept is something that I abide by and go through great efforts to share with others. Through my Scouting experience, I have learned countless values that I demonstrate in my daily life. Having had the opportunity to travel to India and work with the local schools, and I was given another platform to share my knowledge and skills that I have developed through Scouts.